In the depth of the ocean , hidden in overgrown stones for years , the Techs unleash their ultimate power : The geothermal energy generation . The most powerful tool of the future forces the world of 2070 to expand their explorations into the deep blue sea . Becoming the focus of gameplay , underwater plateaus offer new industries , large production chains , and formerly unknown resources . This success elevates the Techs to a new level : The Genius Population . They assert themselves even over the sea surface . Impressive monuments , various new buildings , and recent demands strengthen their position . Underwater exploration and exploitation will require you to take advantage of your environment mastering a brand new resource , and using both diplomacy and trade as your most powerful weapons to make your civilization thrive in this hostile environment . Set amongst isolated islands , you will have to conquer remaining stretches of land and dive underwater to create a futuristic submerged industry supporting your expanding economy . To nurture your supremacy , build new buildings , erect monuments , open power plants , exploit exclusive energy fonts , and develop underwater trading routes . Evolve , grow , and access a new civilization development stage to gain control of the advanced Genius population . Yet even though evolution is at the very heart of the gameplay don ’t underestimate your environment . You might be confronted by devastating natural disasters such as a tsunami which could tip the balance against you. A new population to discover : Begin the game embodying either the Ecos or Tycoons and gain experience to take control of the Techs .This add-on offers you the opportunity to unveil the mysteries of the Techs whilst ensuring the evolution of this futuristic faction . Gain access to an additional Techs civilization level and thus to a brand new population best known as the Genius Population , extending gameplay features. Erect a Tech Monument and over 30 new Buildings . Dive underwater and take advantage of over 80 brand new items to develop your industries , strengthen your economy , and exploit new energetic resources. Benefit from massive underwater energy production , set up geothermal power plants and maintain supplies to your islands to fuel your economy . Redesign desolated lands : build underwater production chains and develop profitable trading routes. Take part in over 150 new challenging quests and learn about new gameplay mechanics playing 6 missions on Hiro Ebashis , the new experimental energy source. Extend your territory through the “ Hostile Takeover ” online feature . Build a powerful economy and use your bargaining power to acquire rival players ’ land parcels in a pacific way. 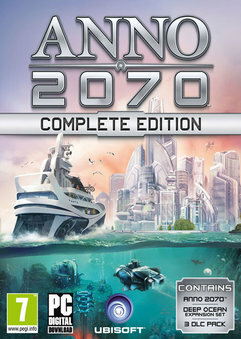 7 Responses to "Anno 2070 Deep Ocean Single Link ISO Full Version"
2. Install the game. This is an addon and it requires Anno 2070 to be installed. 3. Copy over the cracked content from the /Crack dir on the disc to your dir. to “%USERPROFILE%\Application Data\Ubisoft\ANNO 2070″ yourself. 4. Block all of the game exes in your system firewall. kok tiap install tulisannya "installation cannot proceed, because either anno 2070 is not installed or the installed language version not suported"